Considered one of the highest cities in the world at an elevation of 4,090 meters (13,500 ft), Potosí is the capital of the department of Potosí in Bolivia, a South American country located in the lanlocked area between Brazil to the north east, Paraguay and Argentina to the south, Chile by the south west, and Peru by the west. It lies on the Andean mountanous region, and prior to Spanish colonization, Bolivia was part of the majestic Incan Empire. The Spanish Empire conquered the region in the 16th century. The mountain was known in Quechua as "Sumac Urku", which translates as beautiful mountain. 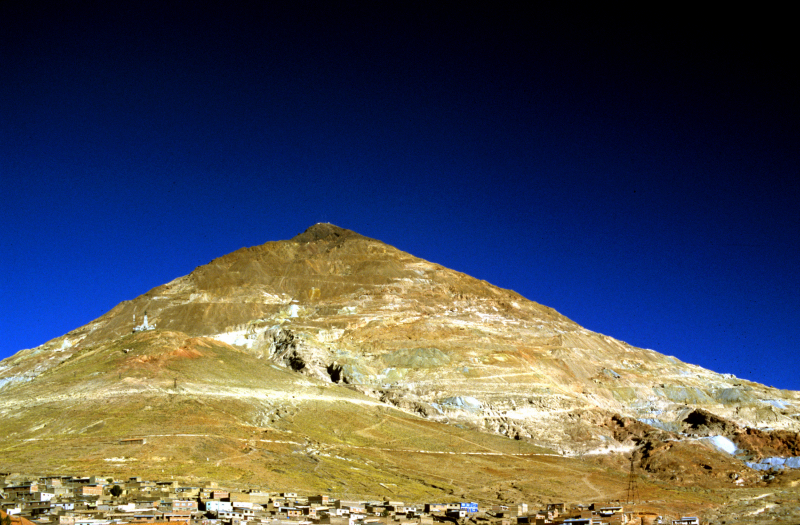 The city has thrived for hundreds of years beaneath the Cerro de Potosi, often reffered to as Cerro Rico (rich mountain), as it is rich in silver ore, which is the reason for Potosí's historical importance. The mountain has been exploited for almost 500 years, and it was the major supply of silver for Spain during the period of the New World Spanish Empire. Potosí was a mithical land of riches having supplied according to official records over 45,000 short tons (41,000 metric tons) of pure silver from 1556 to 1783. Indian Incan laborers, forced by Francisco de Toledo were enslaved and made to mine deep in the mountain for the precious commodity that was to make Spain wealthy. In addition to the indegenous labor force called the mitayos, that had to transport the ore up the shafts to the mouth of the mine, the Spanish imported 1,500 to 2,000 African slaves per year. An estimated 30,000 African slaves were taken to Potosí during the colonial era. The African slaves were forced to work as acémulas humanas (human mules). Since mules would die after a couple of months pushing the mills, the colonists replaced the four mules with twenty African slaves. It is estimated that over eight million people have died in the mines, not simply from brutal labor, but by mercury poisoning and the inhalation of silicosis which damages the lungs. Today over 9000 Indios work in miner owned cooperatives, in search of any remaining minerals within Cerro Rico. Sadly, among the workers are many child laborers often as young as ten years old. They work in a maze of over 20,000 tunnels. Fatal accidents are often and most miners fall victim to the black lung disease and die by age 40. It is known as "The Mountain That Eats Men". To gain strength enough to go deep into the mines, the miners chew on coca leaves, which will give them the energy to stay down often for up to eighteen hours at a time. The coca leaves help with controlling fatigue and hunger. Due to exhaustive mining, the mountain has shrunk from it's original glory by a few meters and there is very little mineral left. The miners meticulously search and pick for the last few remaining "veins" of silver and as a result, the mountain is in danger of collapsing making the ardous work extremely dangerous and life threatening. Imposed by the Spanish rule, the governors of the mine struck fear into the workers if they refused to work. And according to their Incan beliefs, God does not exist deep below. So the Spaniards played on that idea, and made them to believe that if they did not work in the mines "El Dios" the God of the underworld would punish them. deep in Cerro Rico, Potosi, Bolivia. In Quechua the Incan locals did not have the "d" sound, so they pronounced "El Dios" with a "El Tio". 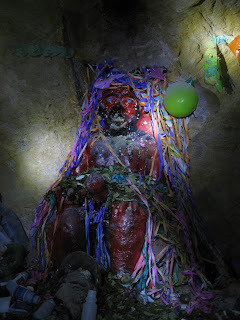 To enter the mine, they enter into the realms of the malevolent being or el diablo (the devil) where El Tío, or uncle presides. If an accident or collapse occurs, they say it has happened only because the Tío has been angered. But if a miner is lucky to find a "plentiful vein", then it is due to El Tío's blessings. He is the lord of the underworld. "What happens inside depends on Mother Earth and El Tío". Everyday, before beginning their work, the miners make offerings to a statue in the form of a goat with horns representative of El Tîo. They offer coca leaves, water, fruits, cigarretes, colored paper, bottles of grain alchohol, incense, and prayers in hopes that he will spare their lives. El Tío rules over the mines, simultaneously offering protection and destruction. At the openeings of the shafts, at regular intervals the villagers of Potosí offer a sacrifice to the devil in the mines, ritually slaughtering a llama and smearing the animal's blood at the entrance to the mine in hopes of calming El Tío and diverting him from claiming more lives. I enjoy reading about other cultures and to think that this still goes on is very sad. Thank you for a wonderful post. Norma, the people of Potosi have no other source of income, so they see no other way to work, but in the mines. What is sad is that many of the young men die at such an early age from working in the mines, then the young boys of the family have no other choice and leave their studies to help sustain the family. Thank you for reading. © Leticia Alaniz. Simple theme. Powered by Blogger.